Record stores are finally making inroads to the suburbs! The next store we went to was just a mile or two away, but it was, strangely enough, located in the suburbs. Smack dab in the middle of a nice neighborhood was the Repo Record store. Apparently, it used to be a sewing store, whose location was more appropriate for that line of business than for music biz degenerates. We entered and were greeted by an impossibly immaculate record store; the likes of which I can only say I’ve seen once or twice in my days. This is what a clean, assiduously organized, well-lit record store looks like, hipsters. Gape in wonder at the browsability that was unparalleled here. 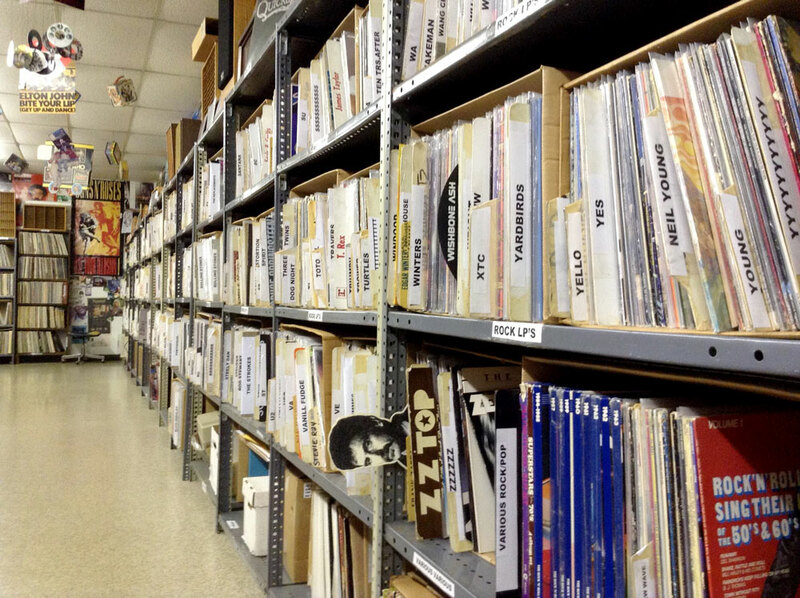 Better still, the main WALL OF ROCK took the entire right hand wall of the store and it presented what would have been multiple bins of 12″ vinyl in a dense, yet incredibly easy to browse display of merchandise. Title cards were there for all the major groups. Look at that photo above. There’s a Yello card for crying out loud!! Just like in my Record Cell!! Actually this whole display reflected exactly how The Monk rolls at home. One didn’t even have to touch the records to peruse them. The owner had taken alphabetization even further than letters and names. He had included common vowel/consonant pairs that account for common band names as well. If there was a Mojo Nixon title card and a Move title card, between them was the “MO” tab where Mott [but not Mott The Hoople] albums could be found… in addition to the final catchall “MMMMMM” tab! I weep at the grandeur of it all! It was exactly how I alphabetize off rack CDs that I need to put back! I might also have piles of “N” plus “NE,” “NO” or “NI.” The bright lighting made it all easy to navigate and the organization made sure that the maximum payoff could be had for the investment of your time. In short, it was an optimal record shopping experience. But we were not in a hurry. Not by a long shot. This was a store to be savored. Ron immediately got an R+B boxed set, agog at the price, which was a third of what he’d have paid in his native L.A. I was flitting from sub-section to sub-section. Not yet getting down to business, but enjoying the spotlessly clean and well organized gestalt. Then I hit the wall of rock. I saw it all impossibly fast since there was no need to flip discs in the bins. I found an Art Of Noise “Beatbox” 12″ on ZTT that I had not seen before, then I found a couple of Scritti Politti records that it was time to buy. I had been admiring the US LP with the embossed, gold stamp lettering for the seminal “Cupid + Psyche” album. I had gone with the import CD back in the day, and the nagging need of this LP version had haunted me for decades. Nothing looked finer, really. If any album had to have been gold embossed, surely it was this one? I’d seen other copies, but none this clean and pristine. Then I saw a US 12″ of “Absolute” which was news to me, having only the UK pressing. Ron mentioned a different mix on this so I pulled a copy for digitizing. 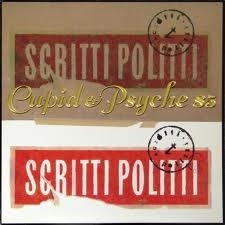 Only a few Scritti tracks elude my Record Cell for that rarities comp just waiting for a REVO number. 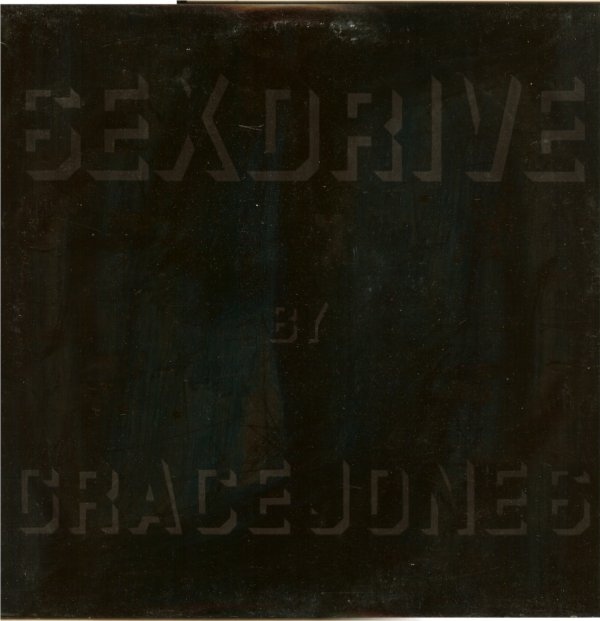 Finally, Ron checked the Grace Jones section and mentioned that I needed to buy the Grace Jones “Sexdrive” US 12″ from 1994. I was not familiar with the track, but Ron said it was non-LP and worth getting. I have not crossed the Grace Jones line in the sand that exists after the “Slave To The Rhythm” project. I have always felt that the material not recorded with the Compass Point All-Stars on the three, classic Island albums was best avoided. I recall seeing a video for “I’m Not Perfect” when it came out and it did nothing for me at the time. But I gave this 12″ a try, since when was I going to see another copy of it, and for $4.00! I looked and marveled at the Japanese vinyl section, filled with always fascinating Japanese 7″ and 12″ pressings, but nothing that I needed. For some reason, it was rife with 80s R+B, with the only thing of even the slightest interest to me being the JPN 7″ of Mel + Kim’s “Showing Out” for a five spot. Still, I passed. Since the store had a DJ mix section, I thought I’d look for the one Disconet release that I have on my want list [Vol. 5/Program 3 – with ABC and Simple Minds] but that was not in the bins. I tried to take it all in, missing nothing, because it might be years before I saw a store like this one again. Finally, I made my way to the CDs, which were displayed exactly like the rock LPs; vertically with spines showing. Nothing was necessary but the second Power Station CD, “Living In Fear,” caught my eye and $5 later, it was mine. This album had always seemed cursed by the fact that it was not on EMI, but the previously unknown Guardian Records [Chrysalis, in the UK]. This seemed weird considering that the first volume turned Robert Palmer into a superstar only nine years earlier. Kind of spooky. This flyer was a work of genius. For those who don’t know, Andy Griffith is the Patron Saint of North Carolina. We shopped in the store for about a half an hour longer, since a huge thunderstorm was happening outside of the walls of the store. While I was searching in the aisles, the owner blazed a trail through the aisle I was standing in… pushing a broom! Seriously! When was the last time you ever saw that happen in a record store. More to the point, when did you last see evidence that it happened at all? When we were done browsing the store, we marveled at how our hands were not filthy! When we checked out, Ron was pretty generous with the compliments and I certainly chimed in as well. The owner soaked up our praise with obvious pride. This was an exemplary store run by a steely-eyed, flat bellied professional of a record store owner. 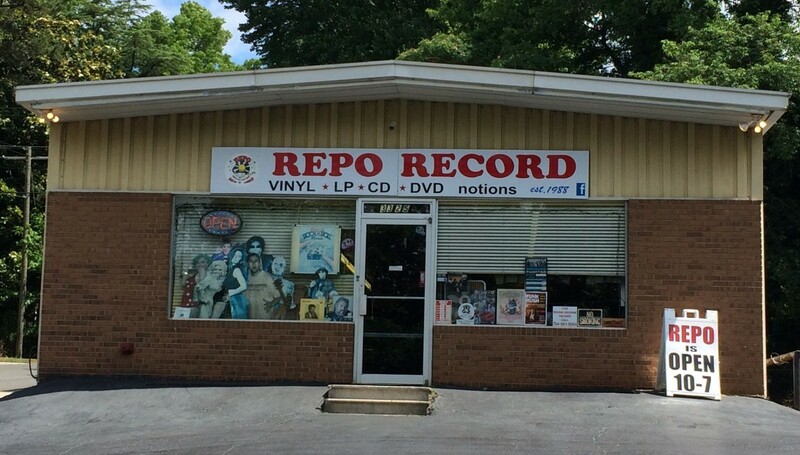 One Jimmy Parker, who had earlier parlayed the original 1988 Repo store into a local chain of three before the Great Record Store Implosion® that followed the scourge of peer-to-peer networks cut them all down. But in the years he had off between 2005 and 2013, when this store re-emerged in its present location, he obviously had been nursing his wounds and plotting his next great record store, which this certainly was. When in Charlotte, you really should treat yourself to a visit and see how it’s done right. The last store on our itinerary had a lot to live up to after this! 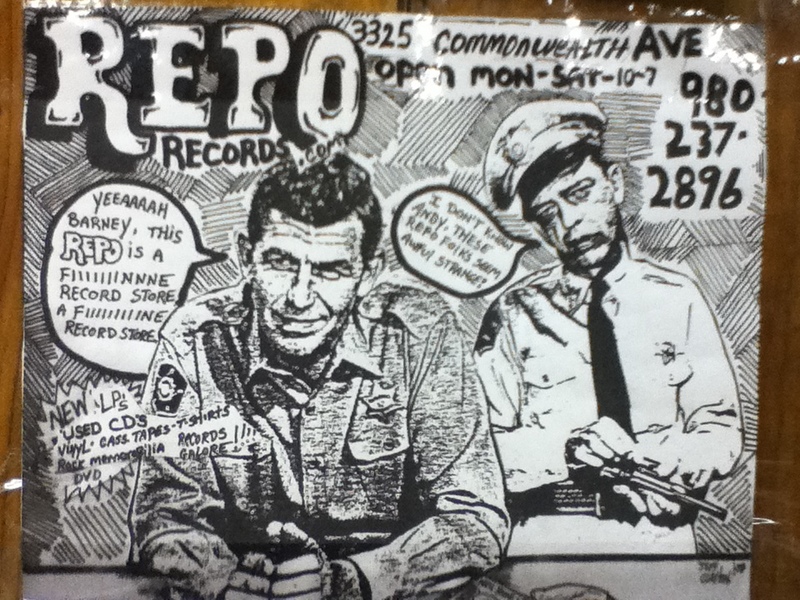 This entry was posted in Record Shopping Road Trip and tagged 2015, Charlotte, Repo Record. Bookmark the permalink. What an amazing shop! Wish it were closer to NYC! Steve – I’ve only been to NYC once in 2000. I was in a training class and never got the chance to shop for records, if you can believe that! Any good ones still there? PPM, there are a few left! In Manhattan, I’ve always had luck at Academy Records, A1 Records, and Other Music. If you like reggae (as I do), Deadly Dragon on the LES is terrific, if very pricey. Rough Trade in Brooklyn reminds me of the heyday of Tower Records, but it is much more expensive than it should be! There are some other shops in Brooklyn that I haven’t had the time to check out (like Permanent Records, which moved to Sunset Park). Last year, Gothamist put together a pretty good list of NYC record stores: http://gothamist.com/2014/08/21/the_best_record_stores_in_nyc.php. Steve – Thanks for the list. If I ever find myself in NYC I’ll have a leg up. PPM, you’re welcome! Let me know if you ever find yourself here. We can dig through the crates together! 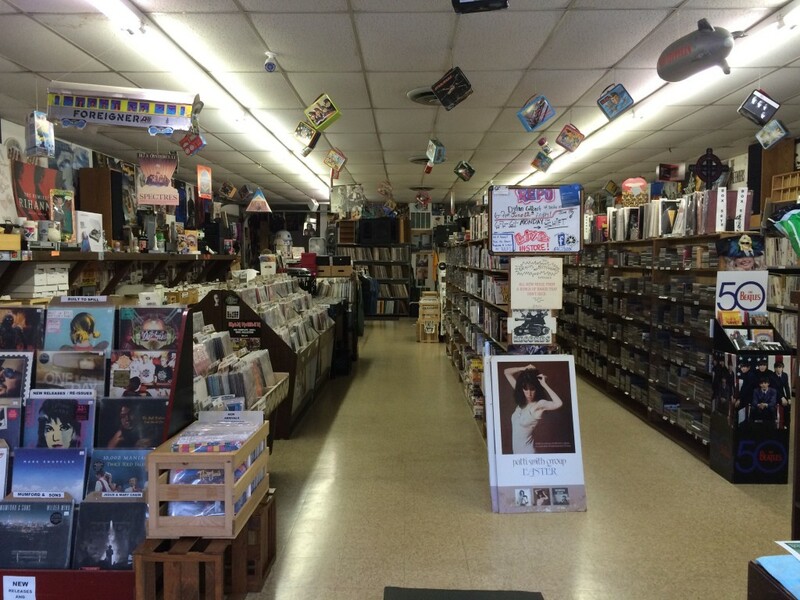 God, I’m so un-rock and roll – I love a clean, well ordered record shop, this place looks fantastic. The Patti Smith display ad would lure me in immediately! I’m not a Charlotte native, but my parents live an hour or so away. I’ve always gone to Lunchbox because they have a reasonable selection of metal and new release progressive rock (think Porcupine Tree). Does this shop have a metal/modern prog section worth a damn? I’m not your standard picker who goes through bin after bin of used records from the 70s. I want a shop with a good selection of the music that interests me. You just have to come and see, We stock the new issues of Metal,Punk,Rock/Psych, Prog. Come on by and dig for a spell. (time & money) OG & New reissues of Jazz,R&B and Country. and some indie releases. We are always buying old LP collections . If our customers want an item we will do our best to place special order to the warehouse. jimmyrepo – Welcome to the comments! It’s about time we has a real record man in the comments! Bluegrasstubb should definitely stop in and I challenge anyone to walk out of Repo Record empty handed. I have yet to really walk in with a fat roll and both of my trips to Charlotte were quickly planned with other events taking fiscal center stage with me. But the next time I’m in Charlotte, I hope to spend more money on those fine goods! bluegrasstubb – Welcome to the comments! I do not swim much at all in the metal waters but I recall seeing a healthy amount of the genre last night. I probably noticed more older Prog, but simply because I am a lapsed Prog fan who notices King Crimson and Nice records more than Porcupine Tree! I have to say that the large store touches many, many genres and specialist tastes. It probably exceeds its own healthy levels of broad stroke coverage with certain Classic Rock artists. It manages to be a highly Beatle-centric store, with huge amounts of The Rolling Stones and [especially endearing to me] David Bowie also in evidence.